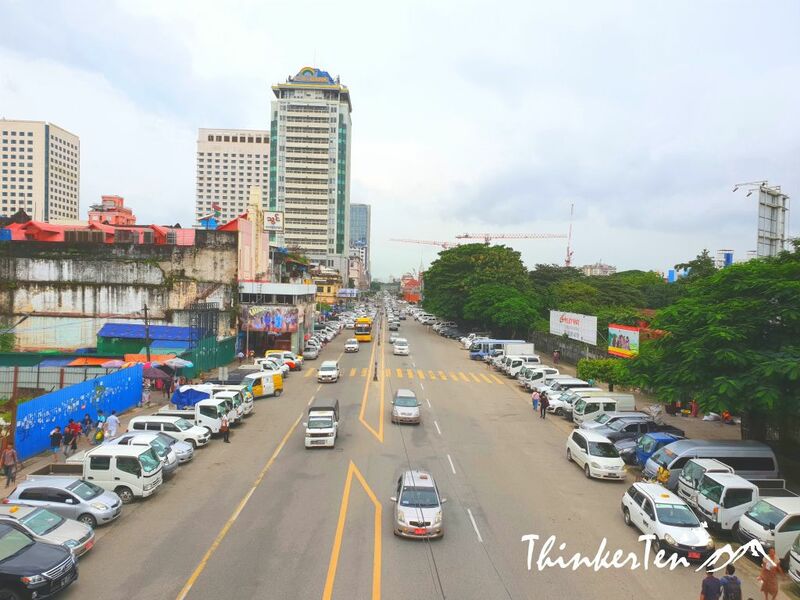 Yangon city is still very undeveloped despite it is the Myanmar’s largest city. 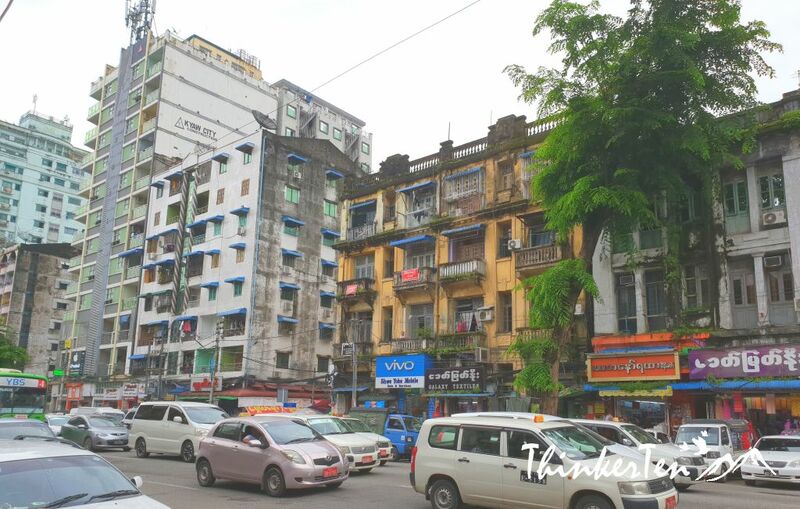 In the heart of Yangon downtown, you see buildings rot and crumble in front of your own eyes. 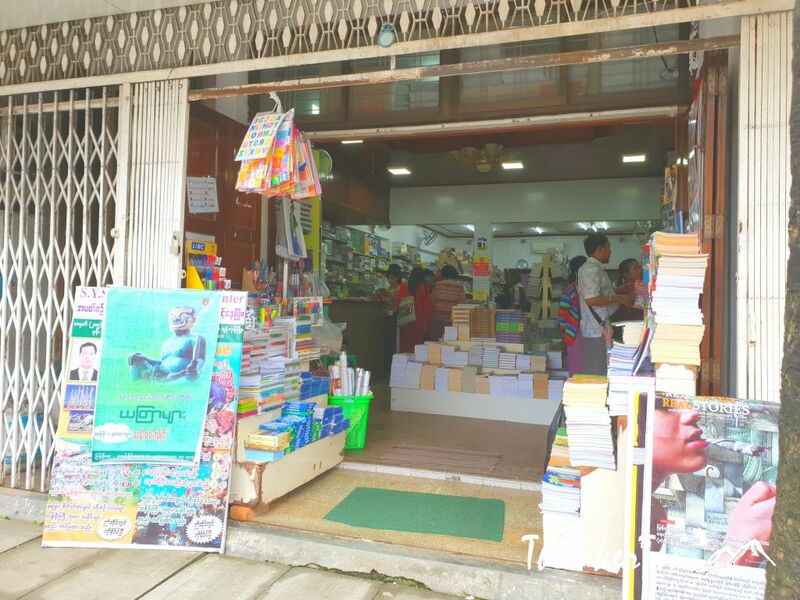 Many won’t believe that Yangon use to be the richest country in South East Asia once a upon a time. 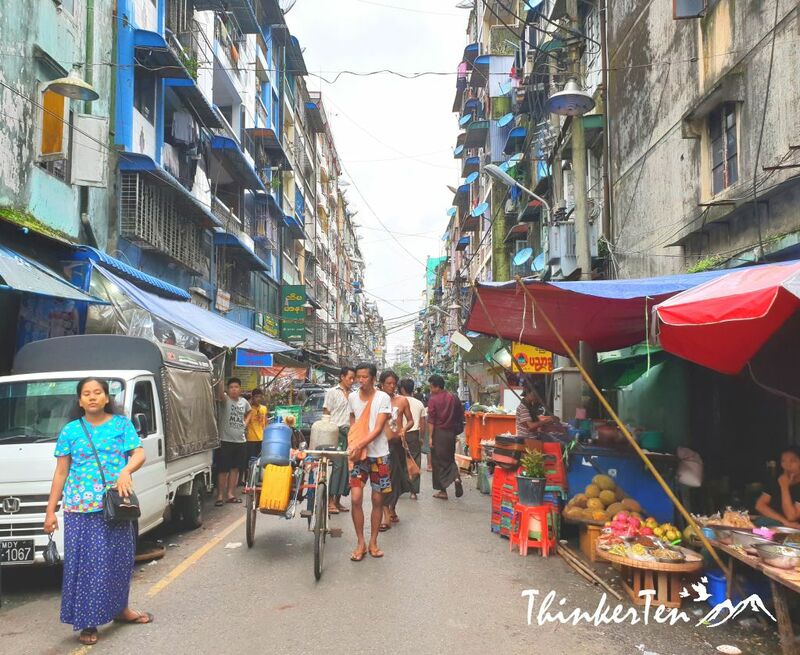 After travelling on the circular train in Yangon, we get off in the Central Station and walk to the downtown of Yangon – The Chinatown Market. 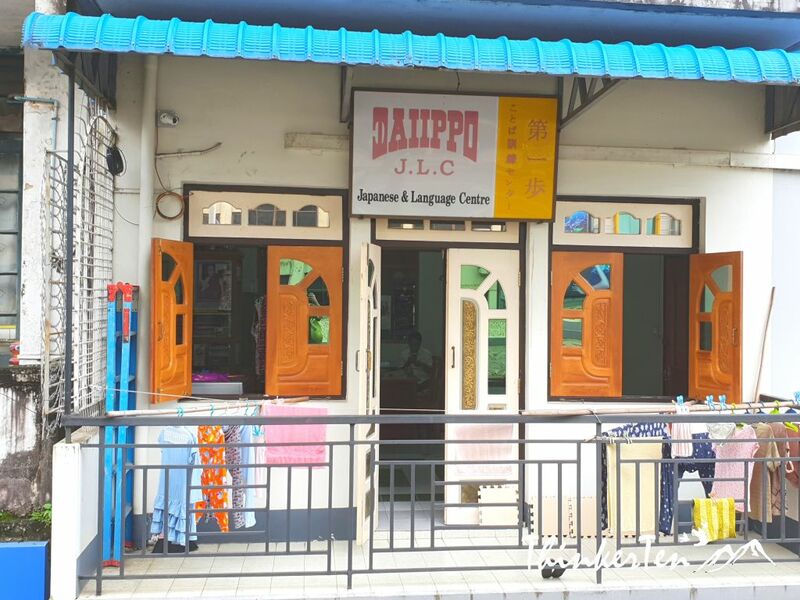 Found a Japanese Language School on the way to the Chinatown Market. 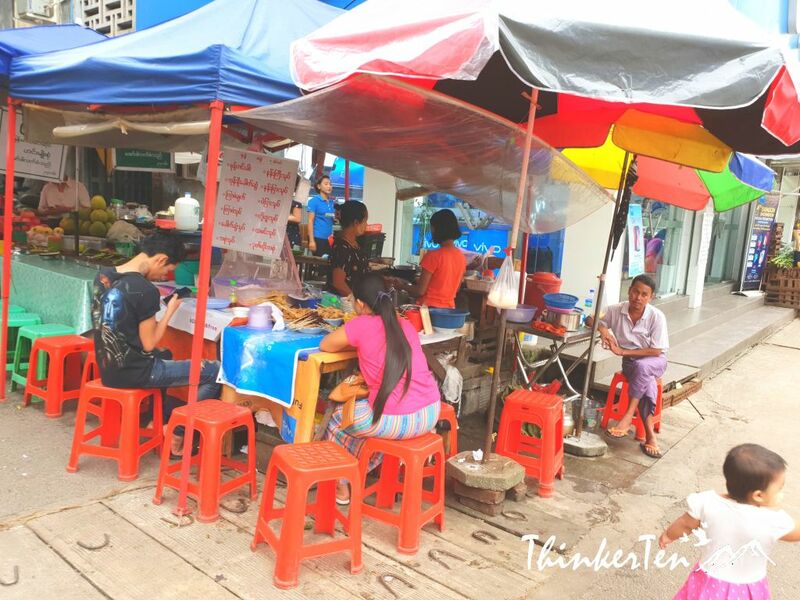 Small eating stall can be seen along the street outside the shops. I did not try any street food as I have weak stomach. 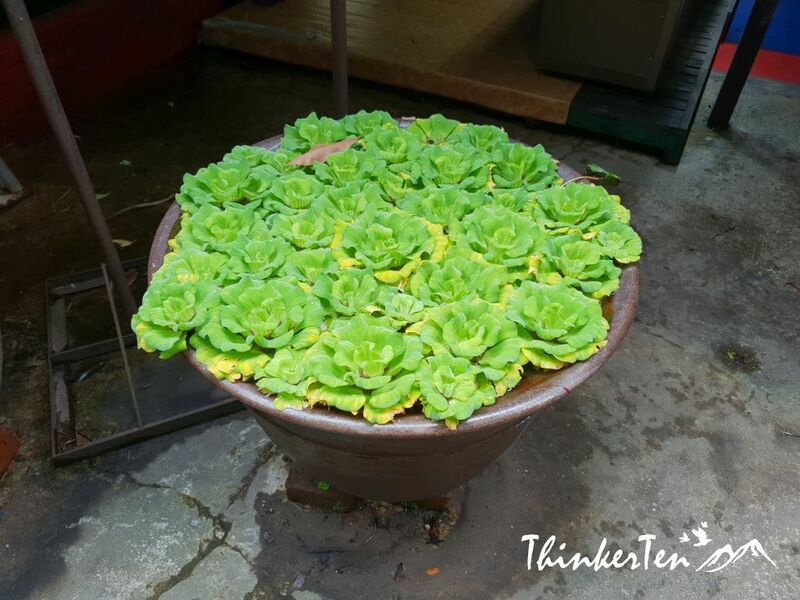 The one thing you notice while you are in Myanmar is the green leave that can be seen almost everywhere. It is called Betel Leaf. 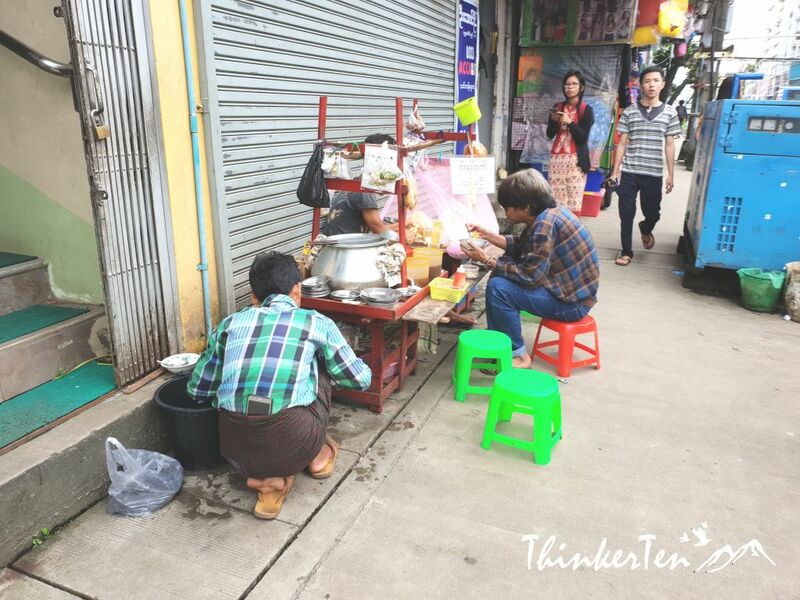 Just like chewing gum, many Burmese chew the betel leaf as a mouth freshener and keep them awake. The price is so much affordable as compared to tabacco but it is as deadly. You also see streets pavement in Yangon full of red stains. And most Burmese men smile with red lips and red teeth. 19th Street is the place for grilled BBQ and beer. Pick your choice of BBQ (pork, chicken, seafood and more) and they will grill them at the spot for you. Order the local beer to go along with this BBQ would be awesome combination. 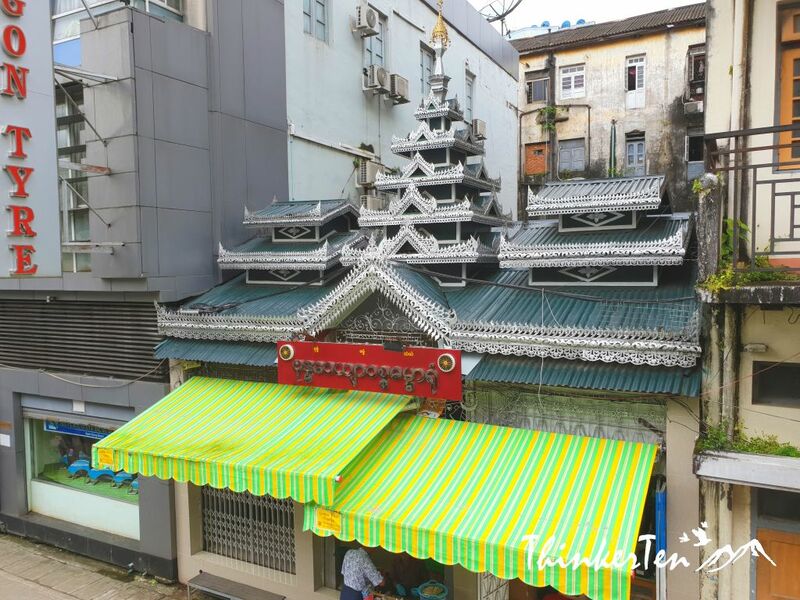 The Chinatown is very near Sule Pagoda and Maha Bandula Park in the downtown of Yangon. There are plenty of roadside stalls serving local snacks and street food when you approach Chinatown 19th Street. And the local wet market is located at the 17th Street. When I was here it was evening so the crowd is very little as compared to the morning. This is the fresh market and if you wanted to see how local live their life here, this is the place to come. 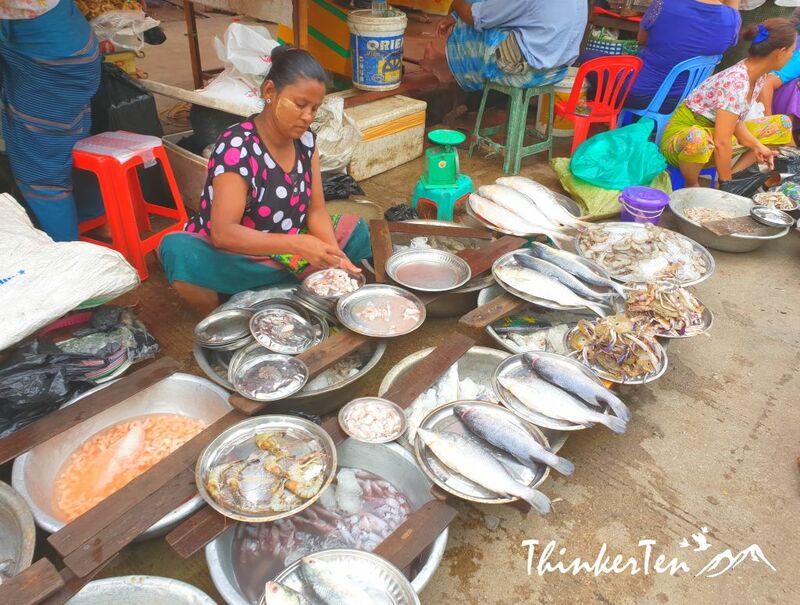 Fresh chicken, fish, seafood and vegetable lay on the floor for local customer to pick them home to cook. 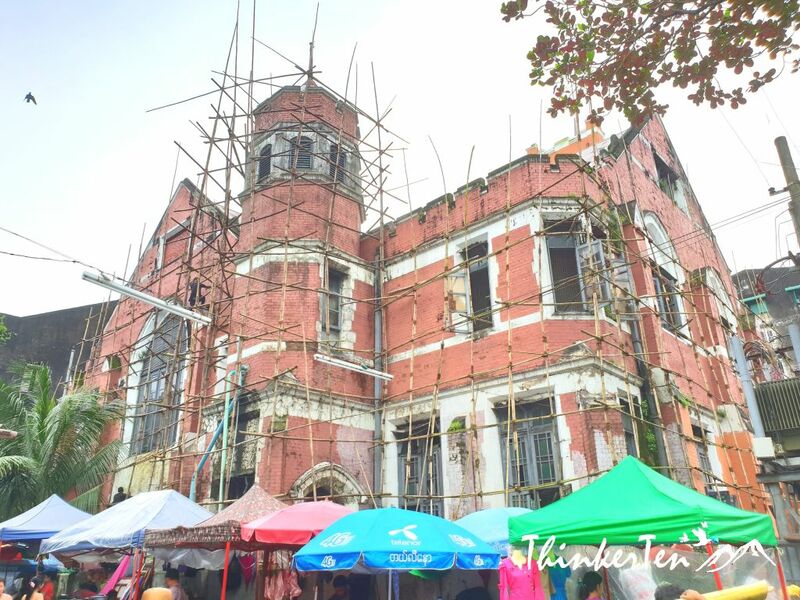 An old building under restoration in Chinatown. Most women’s faces are painted with Thanaka Powder, the yellow powder on their cheeks. This is one of the traditional make up in Myanmar and they believe it bring down heat and smoothen the skin. Usually wear by Burmese women and young children. Some men too apply Thanaka powder on their face too. Interesting to learn that men are behind the sewing machine at the tailor shop. Our lunch took place in a restaurant mainly for tourists as I only see tourists and expats, such as Japanese, Korean and westerners in this restaurant. 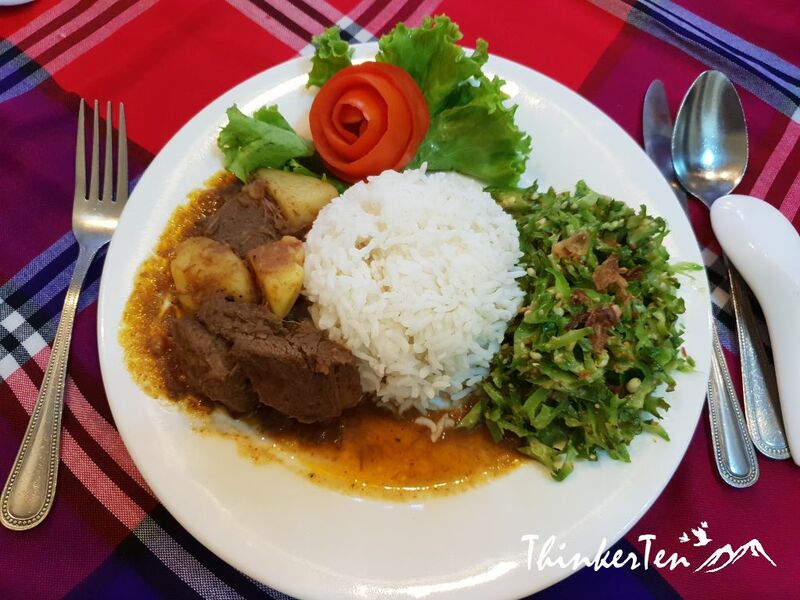 Padonmar restaurant is located in a local Burmese home. 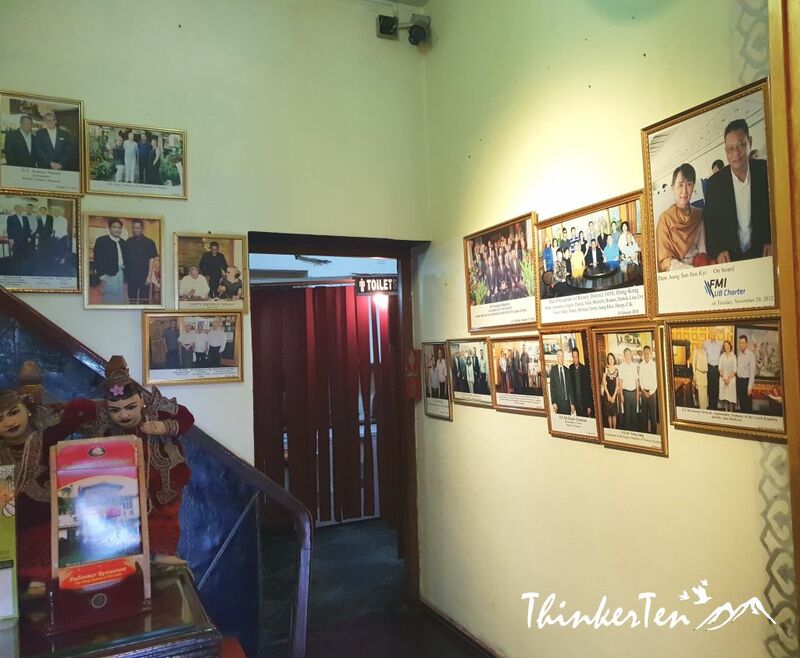 Upon entering the restaurant, you see the wall of fame. One of the proudest picture they have there is with Aung San Suu Kyi. If you happen to stroll around in heart of Yangon, the wet market & 19th Street BBQ Heaven are a must to check them out. 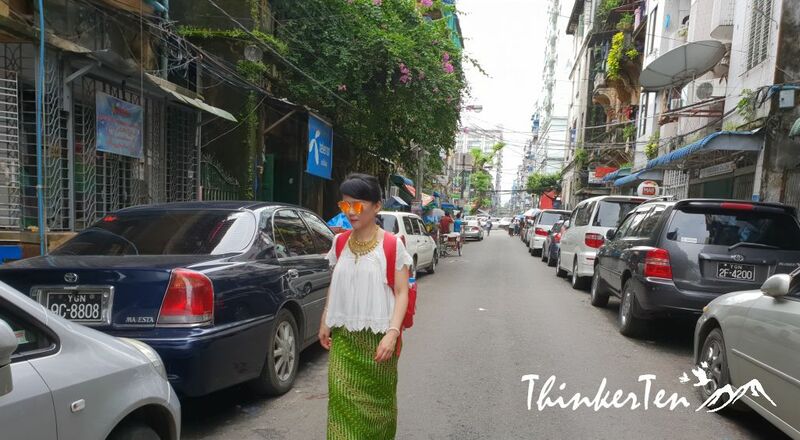 It is filthy, smoky and uncomfortable but that is part of the travel experience while in Yangon City. 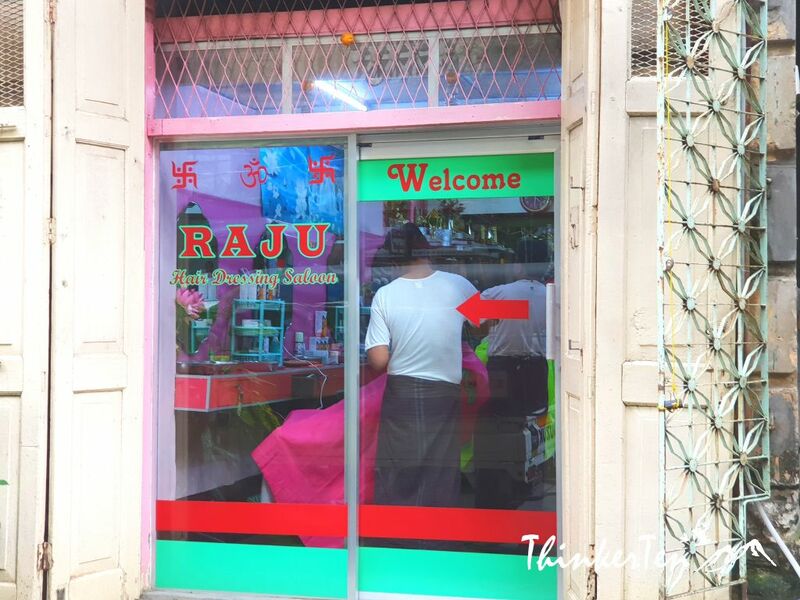 Yangon has always been a mix of British, Burmese, Chinese, and Indian influences. You get to see it all here. 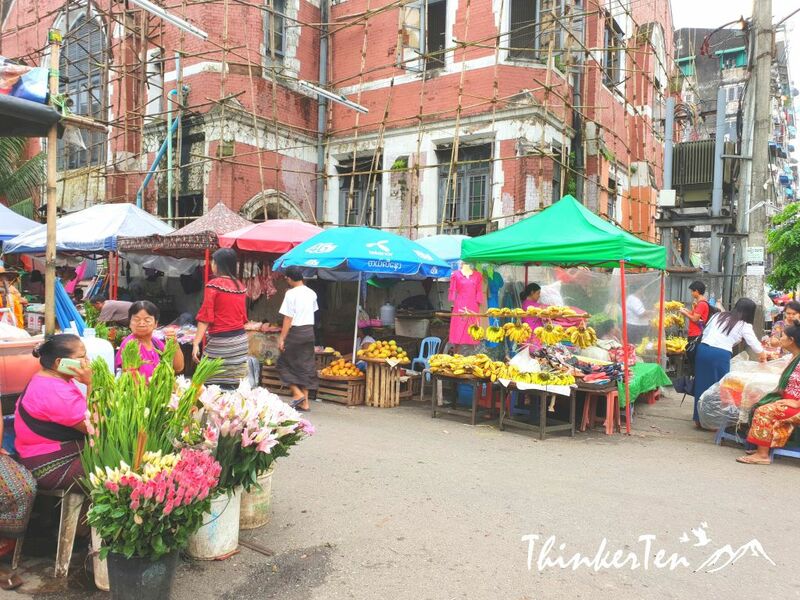 The rundown alley, the yellow thanaka painted faces, men in longyi/sarong and chewing betel leaves making this place very exotic to visit. I have never been in this place it sounds like a perfect destination for the whole family. To explore children to see how other live their life would strongly benefit them and let them see things from others’ perspective. I have never been to this place and I still want to visit this place despite of want you experience as you’ve said smokey place and feeling uncomfortable is a part of every travel. Myanmar is a nice place and I would love to go there! It dirty and smoky but still I need to see it myself, that is the real life of how people live here. This would be my type of place to visit. I love to go where the locals do and the 19th street sounds like such a place. Not sure that I would eat anything there, if you say it’s so filthy, but I would definitely like to visit. Yes, you are right. I was not brave enough to try any food there as it look very filthy and I don’t want to get food poisoning since I have a very weak stomach. Just looking is good enough for me. 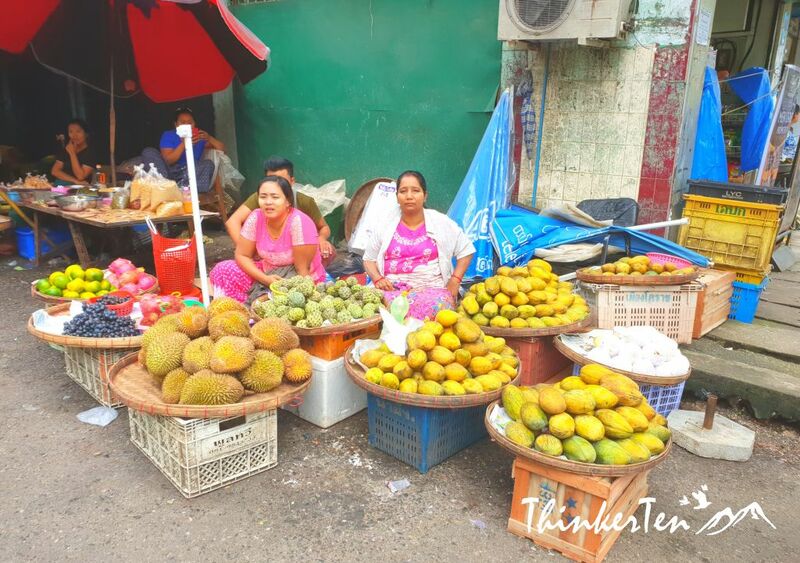 Looks like a great place to viist – love all the markets and the tasty looking food! The wet market here in Chinatown Yangon are for local to get their fresh meat and vegetables. It get super crowded early in the morning but lesser people in the evening. In the morning, it is so crowded that you can barely walk through and many sellers even put their stuff in the middle of the road. Looks like such a unique place to visit with lots of character! The food looks delicious. 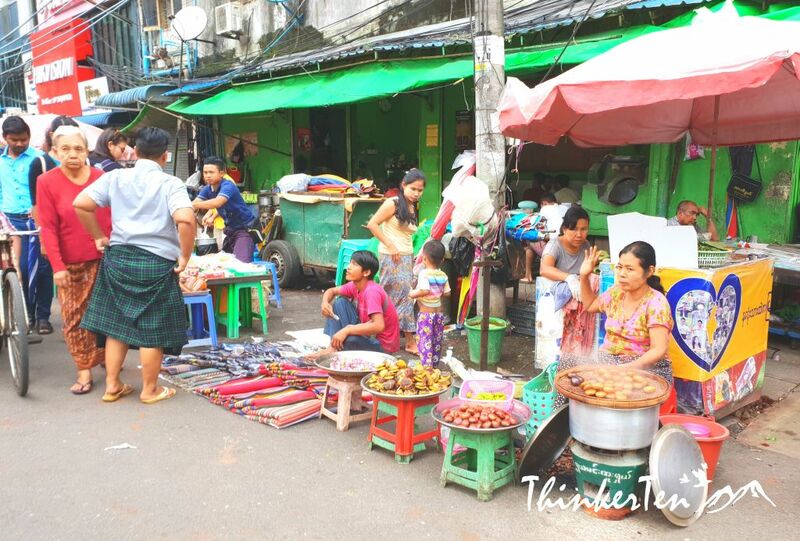 There is another alley called 19th Street in Yangon which is famous for all the grilled BBQ. 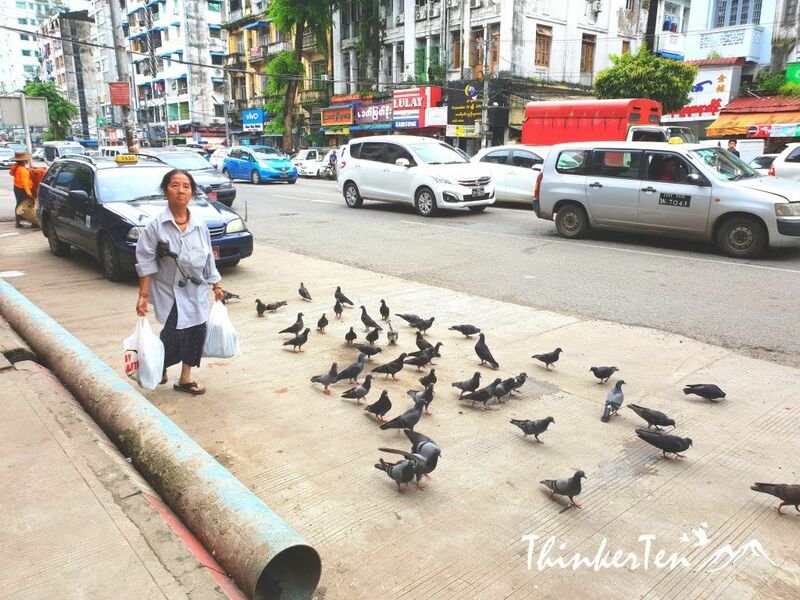 I’ve never visited a city like Yangon before. I had Chinese friends and they were awesome! But they went back to China. This place seems to be very interesting. I would love to add it to my traveling bucket list. I find the betel leaves interesting. I feel like I may have heard of them before. 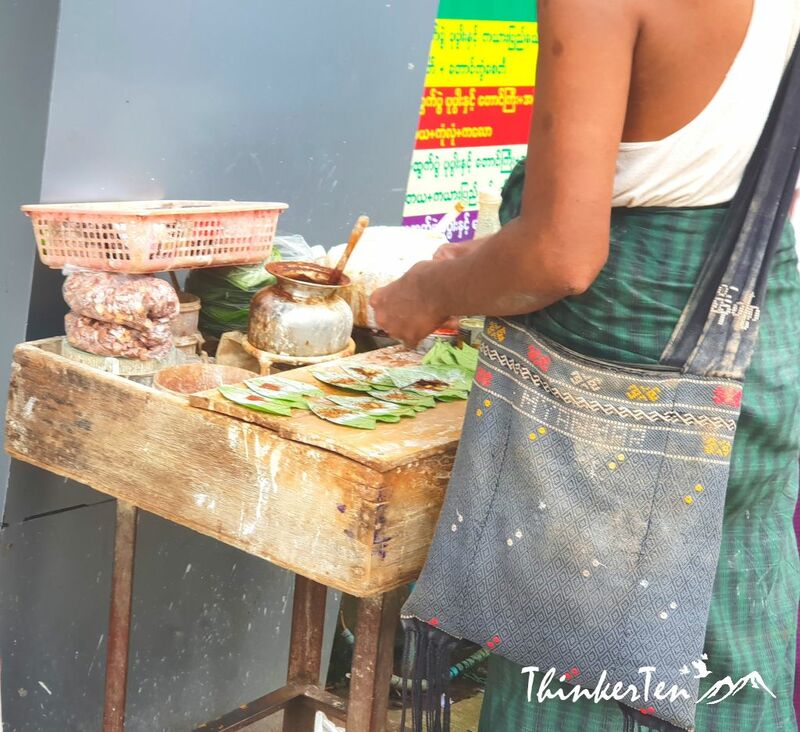 Chewing betel leaf is so popular in Myanmar and people smile with red gum and red teeth. You also notice many red spots on the roadside and that are the spitting from the betel leaf. I love markets like this! I would so love to spend the day wandering around and seeing all of the wonderful things being offered for sale! The wet market here offer things for the local to buy home to cook. 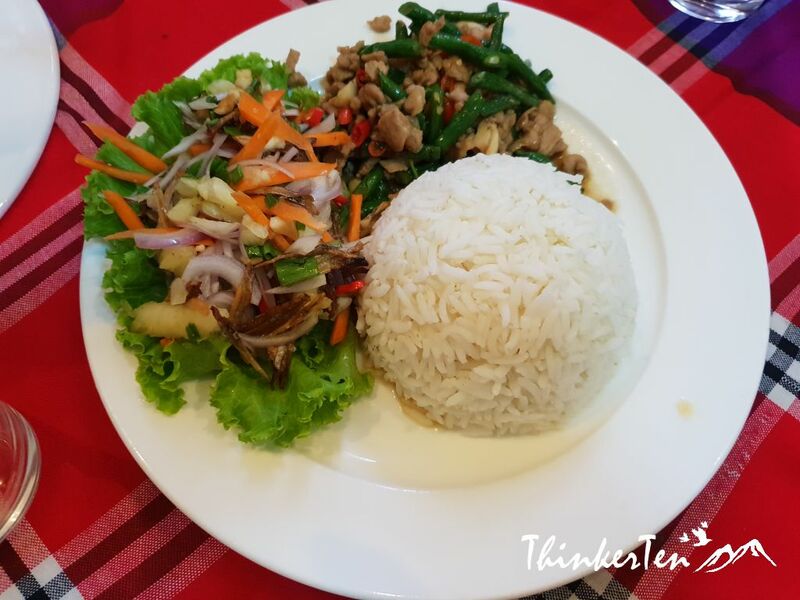 You get an insight of what local eat. Thank you for sharing your pictures and experiences about a part of the world I don’t have much knowledge of. The food looks absolutely delicious! 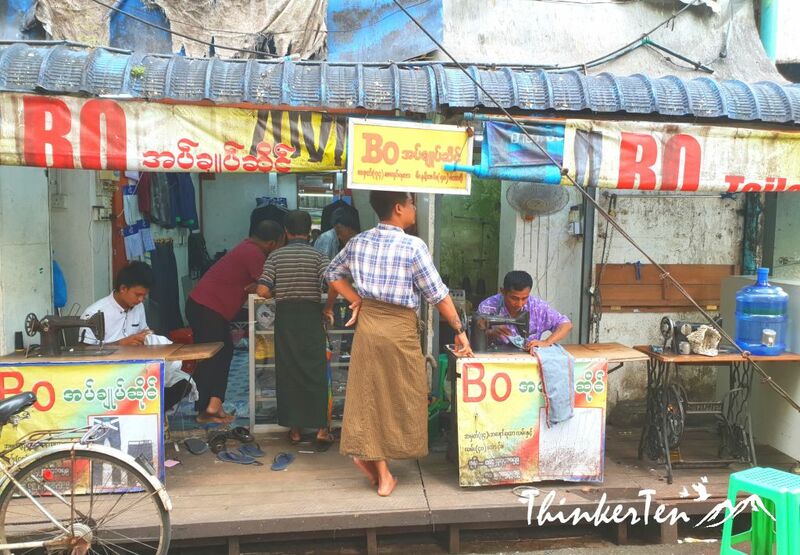 As Myanmar has just open it door to foreigner less than 10 years ago, this country still has many untold stories and I felt like going back to the past, 60s or 70s. Very interesting as you don’t get to see such scene anymore these day. Myanmar is still very backward as compared to the rest of South East Asian country, the infrastructure and tourism is still far behind Thailand and Vietnam. Give them few years. The food looks so tempting I immediately start to feel starving! So nice and so delicious! 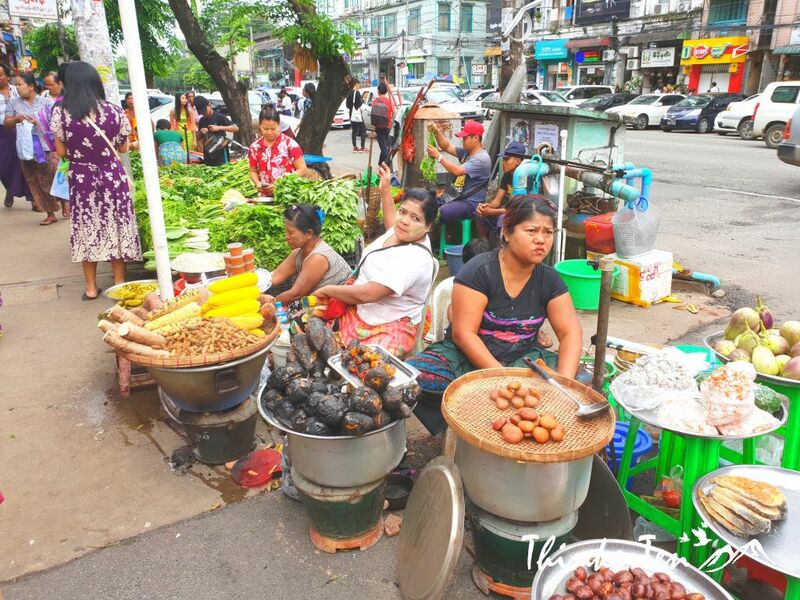 The fresh food from the wet market are for local people to buy home to cook and the BBQ at the 19th Streets are a good place to hang out with locals. I had a friend who lived in chinatown and she was always bringing me things. She passed away and I really miss her so I should visit myself. I’d love to try Betel Leaf, it sounds interesting. What a great cultural experience and those pad Thai noodles look so delicious! 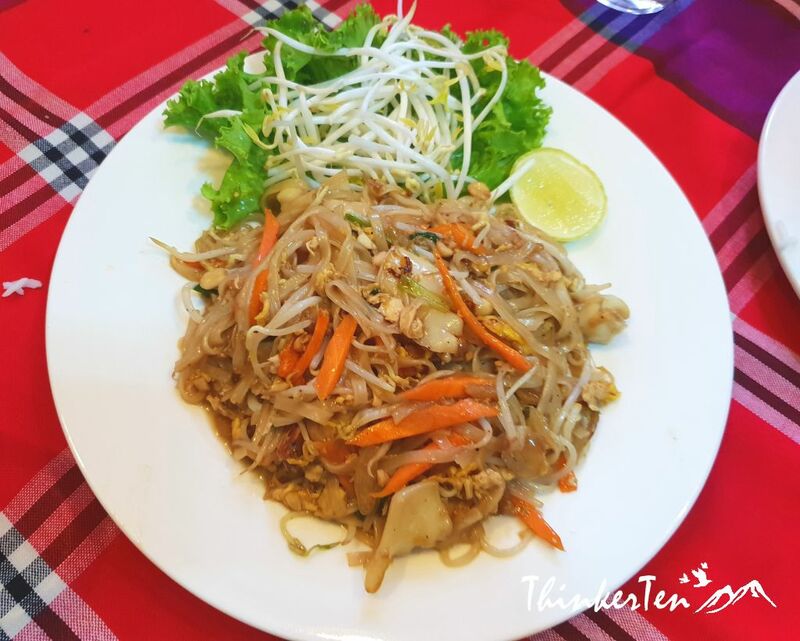 I love Pad Thai noodles a lot and glad can be found in the restaurant in Myanmar too. Pad Thai is Thai cuisine though. I would love to visit Myanmar, the culture looks so interesting and I’d love to learn more. The culture here in Myanmar is heavily influenced by Buddhism and the Mon People (Thai). 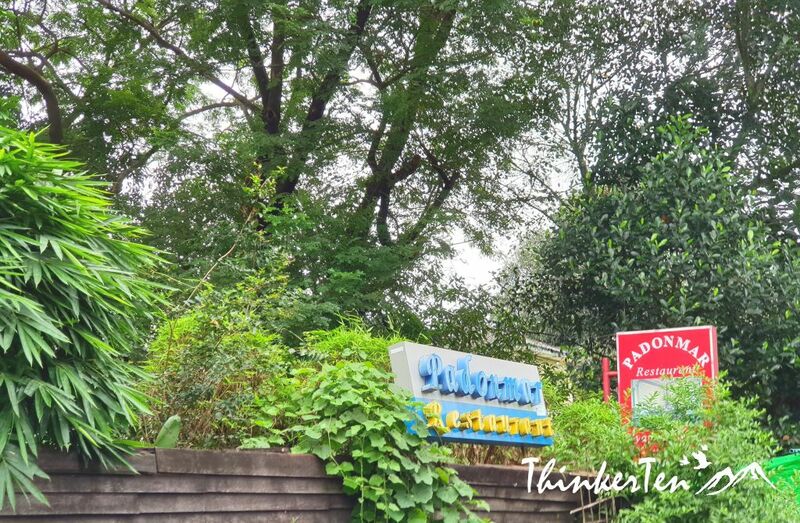 Pretty similar to the neighboring countries such as Thailand but I felt there are additional Indian elements in it as it also shares it border with India and Bangladesh. It seems very interesting place to visit. Myanmar has a great culture, I still love to know more about their history. Myanmar is a huge country and also the biggest country in Southeast Asia. It has strong influence from the British as it was colonised by the British in the mid 19th century; it also occupied by Japanese during the Second World War. So you see a blend of culture here. Yes, this is an exotic place to observe how the local Burmese live their life. Pretty interesting to have a little stroll. You had me at BBQ. Love seeing locals, how they live and where they eat. Great post! I was quite tempted to try out their BBQ on the street too but due to weak stomach I didn’t.